Finally, cold cathode lights can be used for much more than illuminating the inside of your computer or making your whip look like it can hover. [James] discovered if he varied the voltage going into the inverter, only a certain amount of the tube would light up. Give a hacker an interesting observation and enough time, and eventually he’ll come up with something really cool. In this case, it’s a cold cathode audio visualizer, powered by fluorescent tubes doing unexpected things. The build details are a little scant, but we were able to coax an imgur album of [James]’ build. He’s using these 20″ CCFL lights with the stock digital inverters replaced with TDK CCFL inverters. 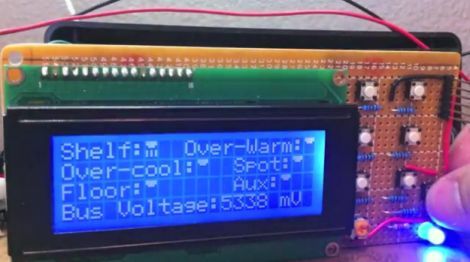 The digital control of this build is provided by an Arduino Mega and a custom shield. We’re guessing the graphic EQ is provided by an MSGEQ7 chip, and the inverters themselves are powered through the Mega’s PWM pins. It’s a lot like an IN-9 Nixie graphic EQ, only much, much bigger. [James] is planning a larger version of this build, dubbed the Mega speKtrum and we can’t wait to see that build along with a proper writeup. [Lee Davison] acquired an Acer laptop that didn’t have a display anymore. 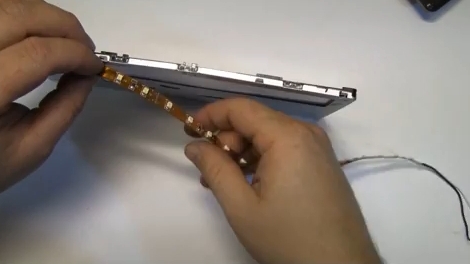 He had enough parts on hand to add in an LCD panel and give it a CCFL backlight. But when he started looking for an inverter to drive the backlight he couldn’t find one. What he did have on hand were some smashed screens that had LED backlights and so the CCFL to LED backlight conversion project was born. He tore into the LED display and found the driver board. Unfortunately he didn’t locate the datasheet for the exact LED driver, but he found one that was similar and was able to trace out the support circuitry on the PCB. This let him cut away the unneeded parts of the board without damaging the driver. He didn’t want to pull out the CCFL tubes until he was sure the LED conversion would work so he tried it out on another smashed panel (where does he come up with all these parts) and it worked great. Once he got everything in place he was very happy with the results. The only drawback to the system is that he doesn’t have the ability to dim the backlight. There are few things more frustrating than trying to tinker at your workbench with suboptimal lighting. [Jeremy] was toiling away in his workshop one afternoon when he decided that he finally had enough, and set out to overhaul his lighting setup. His workshop is incredibly bright now, sporting a handful of under the shelf CCFL tubes to complement the mixture of cool and warm LEDs that are mounted on the ceiling. One thing we really liked about his setup is that he added a handful of LEDs to the bottom of his workbench, aimed at the floor – perfect for those times when a tiny screw or SMD component goes missing. Everything is controlled by an ATMega 328 that he shoved into a project box, allowing him to tweak the lighting to suit his needs using a few simple buttons and a small LCD panel. [Jeremy] says that the entire thing is “overkill” and that it is decidedly the messiest wiring job he has ever done. For something that was put together hastily in an afternoon, we think it’s just fine. The only thing we’re left wanting is some schematics and source code. As far as the overkill comment goes, say it with me: There. Can. Never. Be. Too. Many. LEDs! Stick around to watch [Jeremy] give a demonstration of how the system operates. [Ammon] repairs busted LCD monitors as a side hobby, so replacing burned out CCFLs and inverter circuits is something he can do in his sleep. 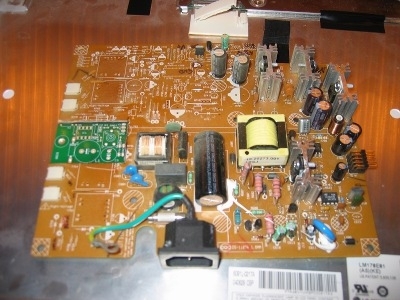 One Dell monitor he received had him so perplexed, that he simply gave up on trying to repair the inverter circuit. He still wanted to get it working, so he had some narrow PCBs made and started working on his LED replacement backlight. He built a driver board for the LEDs, populated with left over components that he stripped from the LCD panel’s inverter circuit. He needed space to insert his driver board, so he simply cut out a chunk of the inverter board and slipped his replacement driver board in its place. As you can see in the picture above, his board (in green) takes up far less space than the original inverter circuit it replaces. He provides a schematic for his circuit as well as a PCB layout file, so it should be fairly easy to replicate his work. He has not posted schematics or layout information for his LED strips, but we’re betting he will if someone asks nicely. Check out this pair of posts if you are interested in reading more about replacing your burned out CCFL with LEDs.